Catholics in many places these days dislike the use of incense. Most often it is a knee-jerk reaction to smell or other perceived “toxins” in the air. In fact, there are no toxins released. At the sight of a cold thurible loud coughing and carrying-on ensues. All the noise is, I suppose, is a passive aggressive way of telling the priest to put the thurible away. 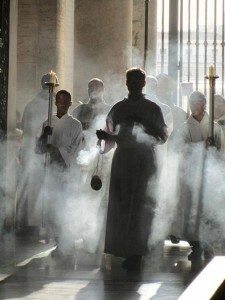 But laity (and some clergy) may be unaware of the reasons we use in incense in the worship of God. I do not doubt for a second that some people have breathing issues. Asthma, COPD, lung cancer, etc are a regular diagnosis for some people. I have a friend who gives me the evil eye when she sees the smoke coming down the aisle. In one parish I heard someone saying that the use of incense there is only used for funerals. And I know that priests and servers have yet to find reasonable solutions in using incense. One safe way not to get into fighting match is to remove the smoking thurible from the sanctuary after it is used and bring it back when it is next needed. Why is it that Catholics use incense? The history of using incense in worship is long. Some scholars point to the ancient world of the Assyrians, the Babylonians and the Egyptians, to ward off demons. At least this is one theory. The Israelites burned incense in Temple rituals, with their offerings of oil, grain, fruits and wine (Numbers 7:13-17). We also read in Torah that Moses erected an altar for the burning of incense at the entrance to the meeting tent where the Ark of the Covenant dwelled (Exodus 30:1-10). From the farthest east to the farthest west, my name is honored among the nations and everywhere a sacrifice of incense is offered to my name, and a pure offering too, since my name is honored among the nations (1:11). Another angel came in holding a censer of gold. He took his place at the altar of incense and was given large amounts of incense to deposit on the altar of gold in front of the throne, together with the prayers of all God’s holy ones. From the angel’s hand, the smoke of the incense went up before God, and with it the prayers of God’s people. Hence, aromatic smoke signifies our prayers, which rise to heaven and to the ear of God. I happen to use different scents for different occasions: Mass at Christmas is not the same as at Easter or a funeral Mass or a Benediction rite. at the elevation of the sacred Host and chalice of Precious Blood at the time of consecration. If used at at the entrance procession and then at the preparation of the altar, the priest is directed to incense the Crucifix and/or the Paschal Candle (during Eastertide). At the Mass of Christian Burial, the priest incenses the casket as a sign of blessing, purification, prayer rising to God and of honoring the deceased. This final point, honoring the deceased, reinforces Catholic teaching that the person has certain dignity. 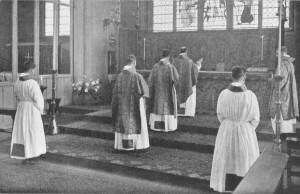 And if the Lauds and Vespers is prayed in a solemn manner, incense is used at the singing of the Benedictus and Magnificat. One last time you will smell incense used is at the Rite of Benediction of the Blessed Sacrament. The gesture of incensing is a venerable and stable tradition of religion; it is a gesture that is not arbitrary. Moreover, it is a profound symbol and it ought neither to be ejected from the Liturgy nor from our experience of prayer. Often I would lite a small amount of incense for my personal prayer in my room because it helped me pray. It aids the sensuality of worship of the Triune God; incense engages the powerful sense of smell which ought to trigger in us a greater experience of wonder and awe; it aids one’s sense of solemnity in worship. 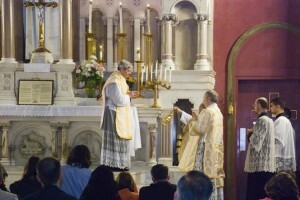 There is a contingent of the Catholic people who still believe in the pious usefulness of sacramentals –not to be confused with sacraments–, those items blessed by a priest or deacon that point to the Divine Majesty: people, medals, scapulars, water, crucifix, vestments, vessels for Mass, salt, oil, pictures of saints, rosaries, etc. I am one of those Catholics who believe that the proper use of sacramentals are extraordinarily helpful to the practice of my faith. The new Book of Blessings has lots of blessings of things and places, but the Weller edition of the Roman Ritual is head and shoulders better than the Book of Blessings. The order of blessing always includes the reading of Scripture, a prayer, and the sprinkling of holy water. It belongs to the Church to set the parameters of sacramentals; over the years she has given directions to maintain, modify, develop and abrogate sacramentals. Most are given to us by the Church, though some are given by the Lord. We ought to be obedient to Mother Church. Sacramentals are not magic; they aren’t contributing to superstition. The difference between a sacramental and magic is the intention, the attitude or motivation for using the blessed object, place or person. The honest user of sacramentals want to be closer to the Triune God. The false user wants to manipulate God. Let me return to the distinction I mentioned above: sacraments and sacramentals are not the same. They have different ends. The Church defines a sacramental as a sacred sign that brings about the effects obtained through the Church’s intercession. The seven Sacraments are designed by Jesus, and always do exactly what they are meant to do. Liturgical and canonical theologians say that sacraments work ex opere operato (“from the deed done”). As I noted about, sacramentals are given to us by the Church, however, though some are given by Jesus. A sacramental “works” through prayer of the Church (ex opere operantis Ecclesiae) but they also work ex opere operantis, that is, through the pious disposition of the person using them –there is a subjective quality here. You know from experience and from movies that sacramentals keep away evil spirit, and piously take away venial sin and prepare the soul for grace. Sacramentals are sacred signs instituted by the Church. They prepare men to receive the fruit of the sacraments and sanctify different circumstances of life. Among the sacramentals blessings occupy an important place. They include both praise of God for his works and gifts, and the Church’s intercession for men that they may be able to use God’s gifts according to the spirit of the Gospel. In addition to the liturgy, Christian life is nourished by various forms of popular piety, rooted in the different cultures. While carefully clarifying them in the light of faith, the Church fosters the forms of popular piety that express an evangelical instinct and a human wisdom and that enrich Christian life. (1677-79). The Code of Canon Law (1983) upholds the theology when it says, “Sacramentals are sacred signs by which effects, especially spiritual effects, are signified in some imitation of the sacraments and are obtained through the intercession of the Church” (1166; Cf, canons 1166-1172). I wear a Byzantine Crucifix that I’ve worn for the last 12 years. The reason why I wear it is to remember that I desire to be placed at the foot of the cross with Blessed Mary and Saint John the Evangelist. It was properly blessed by Abbot Joseph and I kiss the crucifix as I remove it from my person prior to bed. I also use holy water in the house and at the edges of the property. In the past I’ve had icons properly blessed. The Catholic Encyclopedia will fill out more information. A Catholic’s use of sacramentals is a richer, more colorful practice of the Faith. As an example of what I am getting at, a wedding ring is a sacramental; it is blessed at the Wedding rites and it is intended to be a sign for the wearer and those who see the ring that a special bond exists between the couple that is blessed before God and the faith community. The ring blessed at a Wedding has different sacramental point than slipping a ring on before the JP. It’s different because it’s blessed at the Marriage rites by the priest or deacon and has the intention of point to Christ. But the ring is changed in a significant way, does the blessing disappear? Is an altered ring duly blessed at the wedding considered a sacramental? Liturgical theologians, hence, hold that there are two kinds of blessings: constitutive and invocative. We define constitutive blessings are given to places (e.g. churches, chapels, cemeteries) or things (e.g., chalices, crucifixes, liturgical vestments and books) that make them sacred and set aside for worship. See the Code of Canon Law, 1171. The blessing of a person (e.g., abbot or abbess, widow, virgin) is constitutive because it changes the status of that person but not in same way priestly ordination changes man. Invocative blessings do not change the secular nature of the thing (e.g., rings, candles, house, car, butter) or give a person a new status (blessings give to people before a pilgrimage). So, to answer the question. The ring’s secularity has been altered and one could in good faith have it blessed again. For more information, read John Huels, “A Juridical Notion of Sacramentals,” Studia Canonica 38 (2004) 345-368. The form of the Mass offered according to the Missal of Blessed John XXIII, the 1962 Missasl (known also as the Extraordinary Form [EF]) is a misunderstood theology, manner of worship and experience. It is this form of the Mass that has been heart of the Church’s prayer and sacramentality for generations, that has produced saints, and that has worshiped the Triune God. The EF was freed from the shackles of ideology by Pope Benedict XVI in his 2007 motu proprio, Summorum Pontificum. You can read the Pope’s Letter to the Bishops about his motu proprio here. Also of interest is Cardinal William Levada’s Instruction on Summorum Pontificum. These three documents are required reading if you want to know what the Magisterium is teaching. Let it be said that there are many, even among our clergy and supposedly educated types, who have a profound distrust and one could claim, hatred, for the EF that they act uncharitably toward those who may love the EF. In the ecclesiastical provinces of Hartford, Boston and New York have deacons, priests and bishops who actively work against the laity and clergy who have an affection for the John XXIII’s Missal. Knee-jerk reactionaries is not what you would expect from educated people! Experience tells me that it is not an exaggeration to say that there is still a great prejudice toward the adherents of the EF. I also know of seminarians harassed by seminary formation people and pastors for, and some have been dismissed from seminary formation for wanting to know, serve and pray the 1962 Missal, side-by-side the the Ordinary Form of the Mass. I have found that attending to the Mass in this form to be beautiful, coherent, faithful, and challenging. The 1962 Missal has expanded my categories of faith and life. I generally attend the Ordinary Form; I do attend the EF regularly for several reasons: the Church in which it is offered is a beautiful place to worship; the Liturgy is often well-done (though not always), I want to know more about this Liturgy as a coherent form of worship, theology and as a way of life; I want to know why people feel the need to discredit and be obstructive of those who have dedicated themselves to this portion of the Church’s liturgical tradition. The title of this post uses the word “still” because I want to emphasize that the EF can facilitate one’s conversion, even re-version, to Jesus Christ and life in His Church. The Mass of the Ages, as some will call the EF, brought humanity for millennia to Christ, and continues to do so. Read this article, “Old form of Mass attracts new generation,” citing the experience of a former anti-Catholic and another who was an avowed atheist who are now a practicing Catholic due to grace and the liturgical praxis of the EF. My purpose in writing on this subject is not to defend the the EF. I hope that the above article will expand your view that conversions to Christ, our own and new ones, is possible through one’s praying of the older form of the Mass. That is, we don’t have to be so rigid to exclude others without good reason. Furthermore, it is my hope that we all act with faith, hope and charity toward others who think a little differently from whatever criteria of the “norm” we happen to utilize. In short, may we be truly Catholic according to the mind of the Church and not our own measure of what it means to be Catholic. 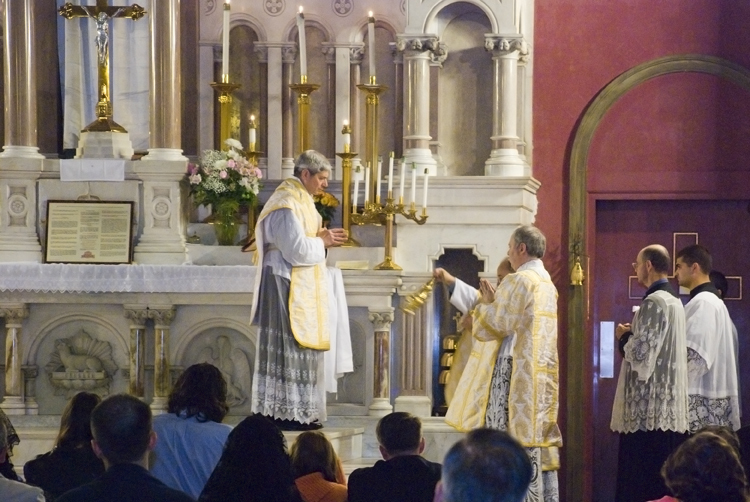 My desire is to have a reasonable celebration of both rites of the Mass that’s coherent with what the Church has done, with what the tradition as given to us over the years, and with what the Church hopes to be as a Christian people with eyes set on the Lord. I happen to think we need to continue with vigor the work of the Liturgical Movement and do things in the sacred Liturgy that are truly Catholic and not ape what our Protestant brothers and sisters do. Catholic Liturgy is not Lutheran Liturgy, and we ought to resist blurring the lines. Saint Benedict, and all Benedictine saints, pray for us. Abbot Michael C. Zielinski OSB, undersecretary of the Congregation for Divine Worship, discusses what is being taught by the most recent pontiffs. Abbot Michael notes the continuity and distinctions in celebrating of the sacred Liturgy by Popes Benedict and Pope Francis. But there are some things that Abbot Michael notes that are not liturgical per se, “the spirit” can be a bit vague some ways. Moreover, there are things that are already expected as the result of the theology and upheld by the rubrics. More reflection on what the synthesis and art of celebrating means, teaches and how it sanctifies. Here is a beginning… The Catholic News Service provides the video feed. Just before Ascension Thursday, there are three days of prayer asking God to bestow his blessing on creation, particularly the on farms that produce the food we need for nourishment. We call these days minor Rogation Days, in comparison to the major Rogation Day is observed on April 25. “Rogation” comes from the Latin rogare, to ask, as in, to ask for God’s mercy, His blessings, His continued benevolence upon all creation. Whether major or minor days of asking, Christians have been doing this type of prayer since the time of Saint Gregory the Great (the major day) and Saint Mamertus (the minor days). This is good example of how we Christians connect trust and confidence in God and the work of human hands on the earth. A Catholic sense of ecology always includes prayer and not merely a commitment to a green ideology. All of our thinking and acting is informed by our prayer, work and prayer, faith and reason. From a gesture of gratitude we give thanks to the Lord for the beauty of the earth. The key biblical passages prayed come from Psalm 69, Jeremiah 10-11: 1-16, James 5:16-20 and Luke 11:5-14. In the Northeast we don’t see too much of Rogation Day observances with Mass, litanies and processions. Sad to see so little done in this area since there are lots of working farms here and it would be a good thing to make supplication to God. In the Midwest can be experienced. Farmers, gardeners, agricultural professionals and others, gather to pray for all who work on the land, for a favorable planting, growing, and harvesting season, and for safety and protection from natural disasters. Some of the Benedictine monasteries will attend to Rogation Days in collaboration with the local pastor or bishop. 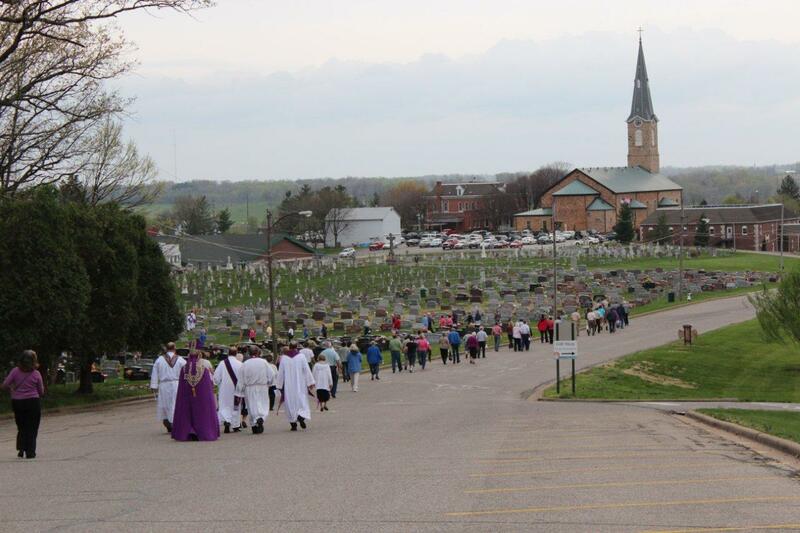 In 2012, the Benedictine Sisters of St Benedict Monastery (Ferdinand, IN) for example, had a procession that went from their monastery to the local parish with Bishop Charles C. Thompson, bishop of the Diocese of Evansville. Offices of Catholic Rural Life in certain dioceses ought to be attentive to this ancient form of prayer. Some places to read further: here and here (with a very good history of the Rogation Day practice).